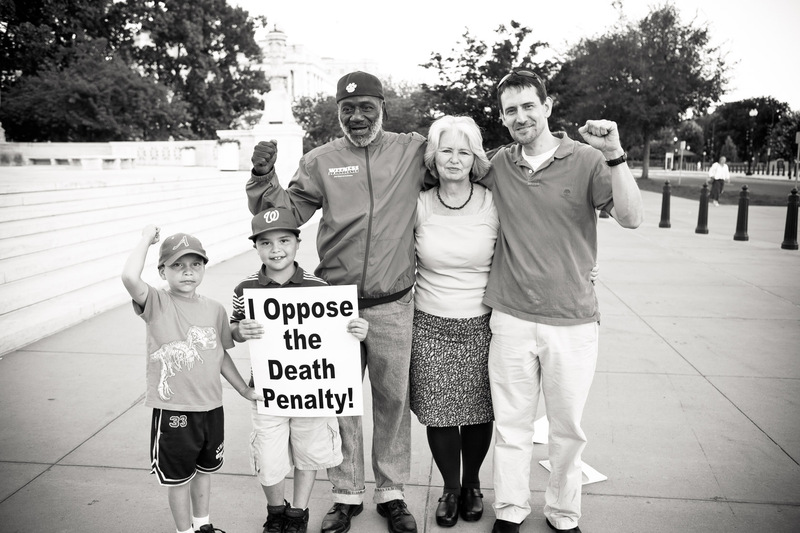 education for alternatives to the death penalty through nonviolent direct action. ANYTIME - Our housing site, CCNV, is available for check in. For information on housing, please register in advance. 9:00 pm to 11:45pm - Our "Last Supper" at the Methodist Building, 100 Maryland Ave NE (next door to the Supreme Court). The evening will include dinner. Everyone is welcome, including event participants, fasters, non-fasters, supporters, and any guests and friends that you want to invite. This is a catered dinner with non-alcoholic drinks provided. Everyone MUST RSVP through our registration page so we order the correct amount of food. We ask that you bring $10-$20 to help cover the costs. Side dishes and appetizers are welcome, but not necessary. Alcohol is NOT permitted on the premises. Note about parking: there is usually ample on-street parking on Maryland Ave on both sides of the street. 11:55 pm - Head over as a group from the dinner to the Supreme Court for a 12:00 am midnight opening gathering to start the fast together. Marks the 47th anniversary of the 1972 Furman v. Georgia decision in which the U.S. Supreme Court found the death penalty to be applied in an arbitrary and capricious manner. 12:01 am - Fasting officially starts, with a 30 minute opening gathering at the court to kick off the fast. 9:00 am to 9:30 am - An orientation meeting to hear more about how the vigil works, what to expect, and ways you can be involved over the next four days. Highly recommended for all participants both new and old. Location: Methodist Building, 100 Maryland Ave NE (next door to the Supreme Court). 9:30 am to 6:00 pm - Vigil outside the court, gathering petition signatures, holding signs, and handing out pamphlets. Busloads of tourists just waiting for YOU to hand them some information, and possibly have a conversation! The adjacent United Methodist Building will be open the entire time for air conditioning, bathrooms and for drinks. 6:00 to 8:30 pm - Abolition Teach-In and Q&A, featuring death row exonerees, death row family members, murder victim family members, as well as leaders and organizers in the local and national abolition movement. We will go live via Facebook starting at 6:00 pm (or a few minutes after). Watch it live, here. 8:30 am to 6:00 pm - Vigil outside the court, gathering petition signatures, holding signs, and handing out pamphlets. Busloads of tourists just waiting for YOU to hand them some information, and possibly have a conversation! The adjacent United Methodist Building will be open the entire time for air conditioning, bathrooms and for drinks. 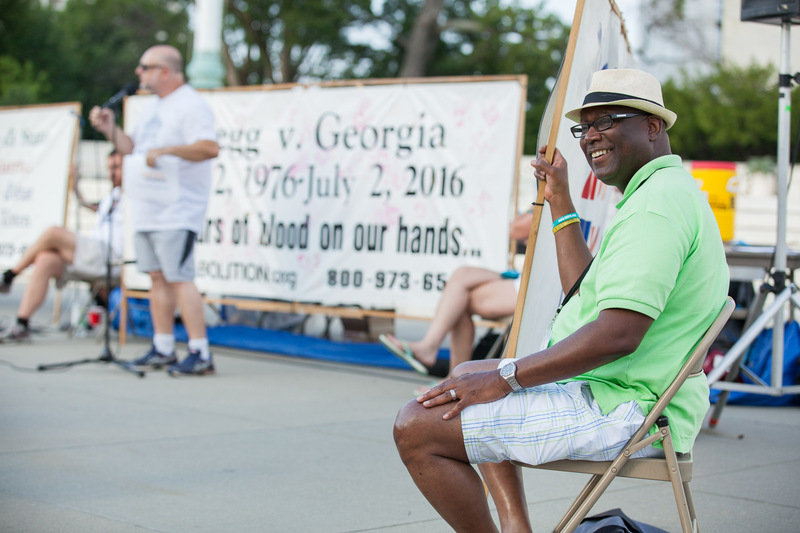 6:00 to 8:30 pm - Abolition Teach-In and Q&A, featuring death row exonerees, death row family members, murder victim family members, as well as leaders and organizers in the local and national abolition movement. Speaker line up to be posted in mid-June. We will go live via Facebook starting at 6:00 pm (or a few minutes after). Watch it live, here. 6:00 to 9:30 pm - Abolition Teach-In and Q&A, featuring death row exonerees, death row family members, murder victim family members, as well as leaders and organizers in the local and national abolition movement. Speaker line up to be posted in mid-June. We will go live via Facebook starting at 6:00 pm (or a few minutes after). Watch it live, here. 9:30 pm through the next morning - The vigil and presence outside the court becomes continuous with those who choose to do so maintaining the vigil overnight on the sidewalk outside the court. Bring a sleeping bag, mat, or pillow for sidewalk comfort! The United Methodist Building and its security personnel will remain open all night for those who need indoor nap breaks or restroom facilities. 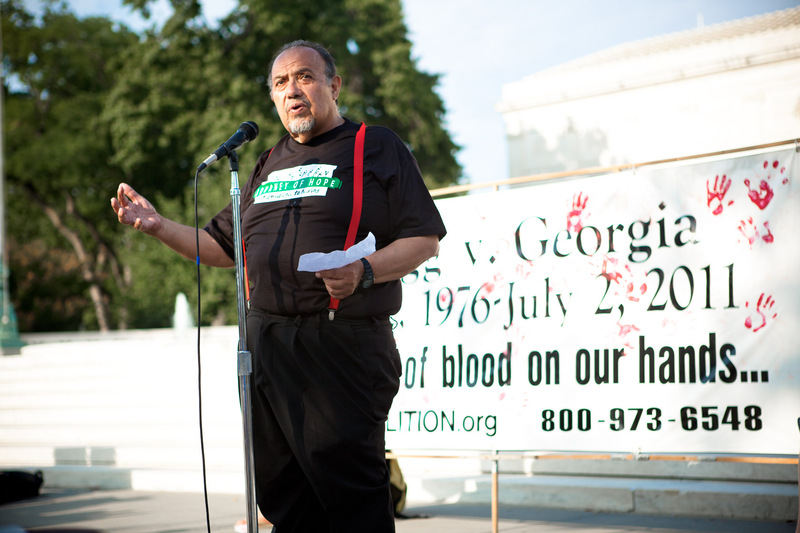 Marks the 43rd anniversary of the Supreme Court's 1976 decision in Gregg V. Georgia, in which new death penalty laws were upheld and state-sponsored prisoner killings were allowed to resume. 12:00 Midnight - Break the fast together with a free meal, prepared by the Dorothy Day Catholic Worker, outside the court. A closing circle will begin at 11:15 pm so people can share about their experiences with the group. Participants are welcome to head out after the midnight meal (some buses and trains depart at this hour) or stay one more night in the CCNV. The fast and vigil has ended, and participants may head back home. Unless arrangments have been made in advance, no housing is available after 12:00 pm Noon. If any state executions are scheduled to take place during the Fast & Vigil, they will be noted above. 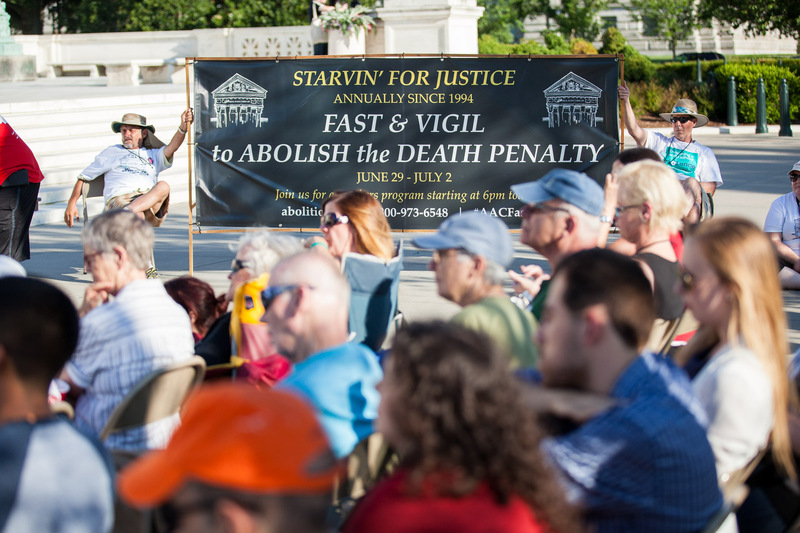 As in the past, The Fast & Vigil will focus attention on each execution and the victim (or victims) in the case around the time scheduled. Please plan to be present at the court at least ten minutes prior to the time specified.